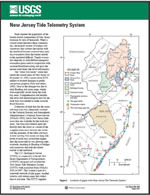 The New Jersey Water Science Center provides valuable short-term (120 day) data augmentation to many locations for: Precipitation, Water and Air Temperature, and even Wind speed and direction at some of our coastal sites. 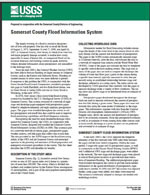 Our field technicians continuously make field measurements and maintain these networks to ensure the accuracy of these data. 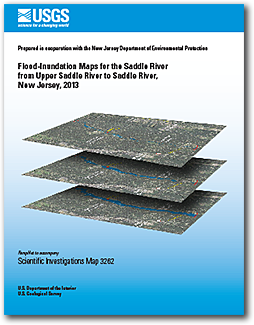 USGS monitors data for estuary and back-bay areas all along the New Jersey coast and links to related projects with more information about coastal flood hazards, water quality, and other topics. 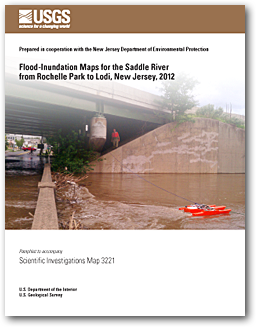 Watson, Kara M.; Hoppe, Heidi L.
Flood-inundation maps for the Saddle River from Upper Saddle River Borough to Saddle River Borough, New Jersey, 2013; 2013; SIM; 3262; Watson, Kara M.; Hoppe, Heidi L.
Hoppe, Heidi L.; Watson, Kara M.
Flood-inundation maps for the Saddle River from Rochelle Park to Lodi, New Jersey, 2012; 2012; SIM; 3221; Hoppe, Heidi L.; Watson, Kara M.
Somerset County Flood Information System; 2007; FS; 2007-3090; Hoppe, Heidi L.
New Jersey Tide Telemetry System; 2007; FS; 2007-3064; Hoppe, Heidi L.